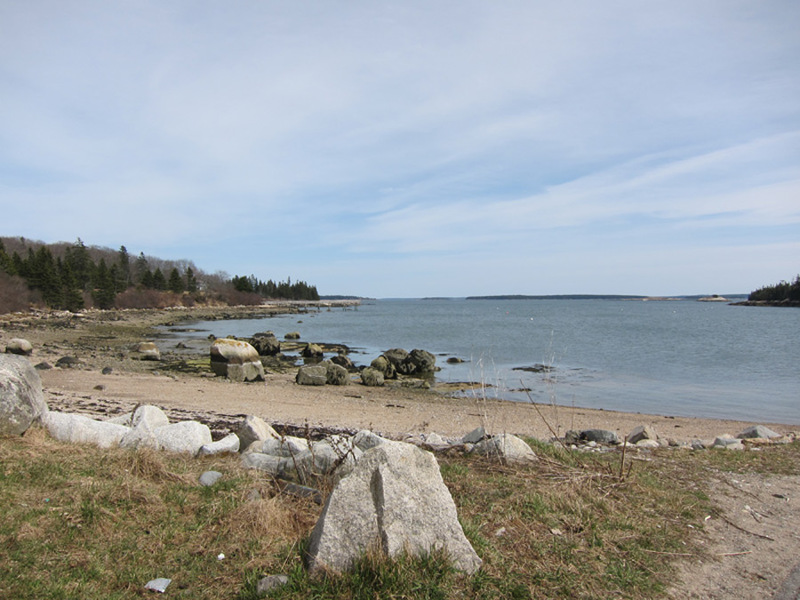 Fishermen use this peninsula in Jericho Bay to access clam flats and lobster grounds, and share the public boat ramp with kayakers and visitors to the small memorial park. 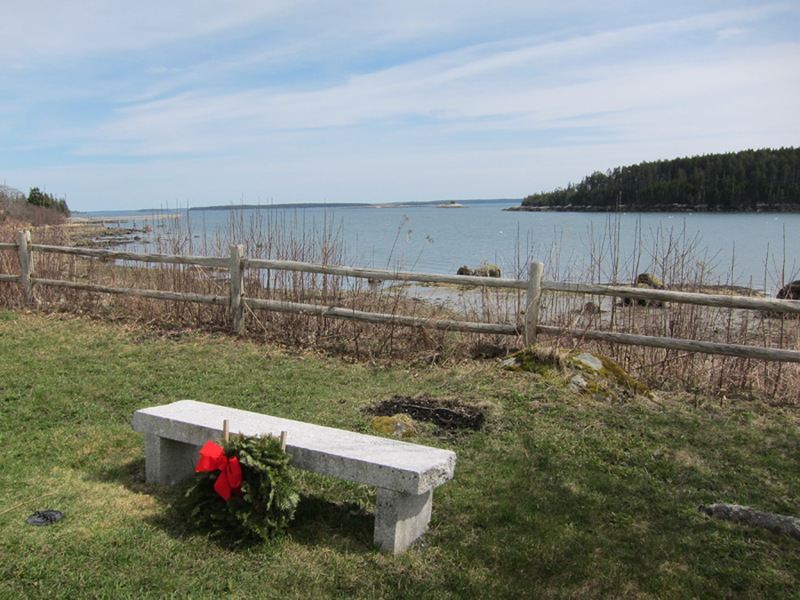 Sit on a granite bench and remember “all the fishermen who brave the sea.” There are more distant memories, too: a Revolutionary War battle, and a Norse coin found on the beach, possible evidence for early contact and trade in North America. Year-round. Limited parking. Accessible. Water access. 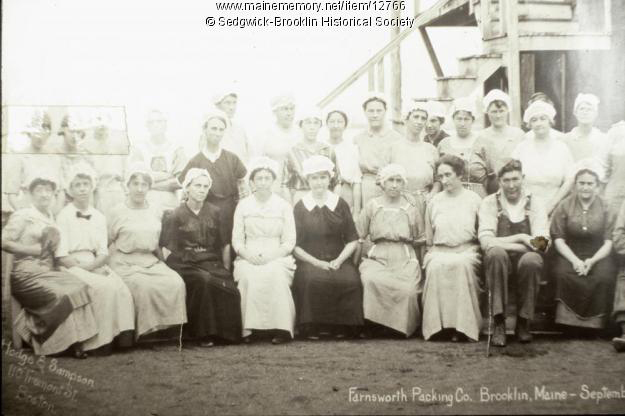 Sardine, clam, and fish canning factories lined the shores of Brooklin harbors. 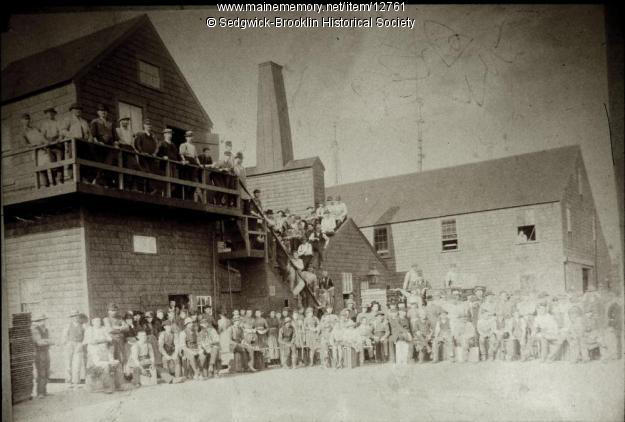 At Naskeag Point, the Mayo clam (later sardine) cannery, shown here in 1927, operated from 1902 to 1929. Most of the canneries clustered along the northern edge of Center Harbor. One of the earliest to pack sardines was the Stevens Cannery in 1890. Before then, fish canneries in the area mostly smoked and packed pogies (menhaden). In 1902, A. E. Farnsworth bought the Stevens cannery and began packing clams (Pennant Brand) in addition to sardines. Farnsworth owned his own boats and had a weir at the end of Flye Point. Next door, the cannery of Steve and Charles Cousins packed blueberries, clams, brown bread, and baked beans. 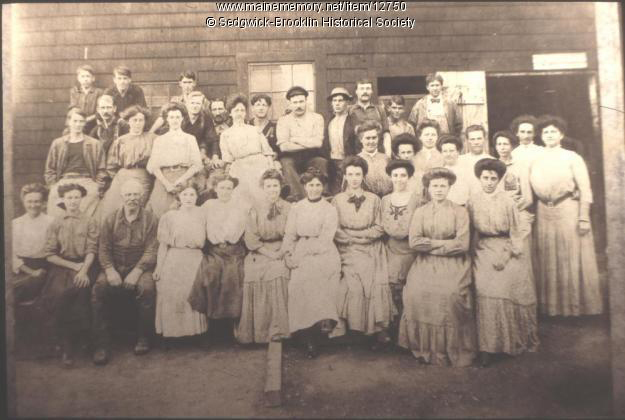 The Cousins cannery was purchased by Emery Herrick and Roy Allen in 1930. W. A. Ramsdell purchased the Farnsworth Packing Company in 1923 and continued to can sardines until 1931. The factory sat unused until 1938, when Frank Sylvester and Frank Day bought the property and turned it into a boat yard. Later it was sold to Herrick & Allen, who returned to canning fish (a label for flaked fish canned by Herrick & Allen shows the business location in Brooksville, home of the owners; the cannery itself was at Center Harbor, Brooklin). In 1952, Arno Day leased the land and re-established a boat yard which later was purchased by Joel White, a lobsterman (and son of writer E.B. White). 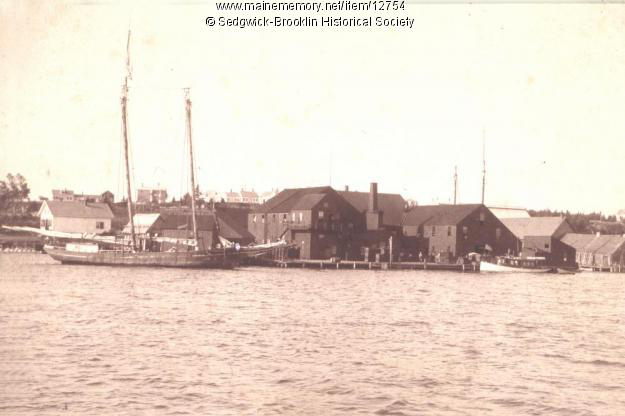 This property is now the Brooklin Boat Yard and Brooklin is now famous for its wooden boat designs and traditional craftsmanship, shared by the Wooden Boat School and practiced by such companies as Atlantic Boat. Brooklin is part of the Blue Hill Peninsula. Check the regional Chamber of Commerce website for happenings. Stay and eat or just eat at the Brooklin Inn and Pub, open year-round. Dine waterside amid a working waterfront at the Wreck Bar & Boatyard Grill in Blue Hill (open seasonally). Hooper, Jane. Early fish canneries in Brooklin. Maine Memory Network. The Downeast Fisheries Trail consists of 45 locations from Penobscot Bay, Maine, to Passamaquoddy Bay, New Brunswick, that showcase active and historic fisheries heritage sites, such as fish hatcheries, aquaculture facilities, fishing harbors, clam flats, processing plants, historical societies, community centers, parks, and other related places. 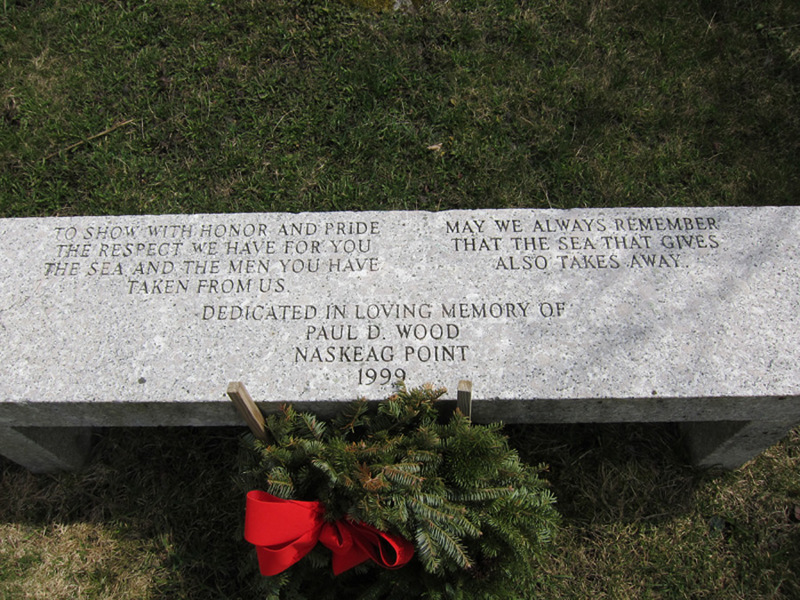 The Trail is an effort to raise awareness among residents and visitors of the importance of the region’s maritime heritage and the role of marine resources to the area’s economy. The Trail builds on these local resources to strengthen community life and the experience of visitors. 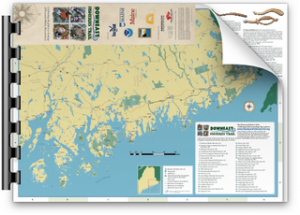 For a printed map-brochure of the Trail, please call 207.581.1435. For more information about the Downeast Fisheries Trail, email or call 207.288.2944 x5834.